This month at One on One, I am pleased to welcome a fellow Pixel Hall Press author, Timothy Quigley, whose novella, Kissing the Hag, was released Fall 2015. 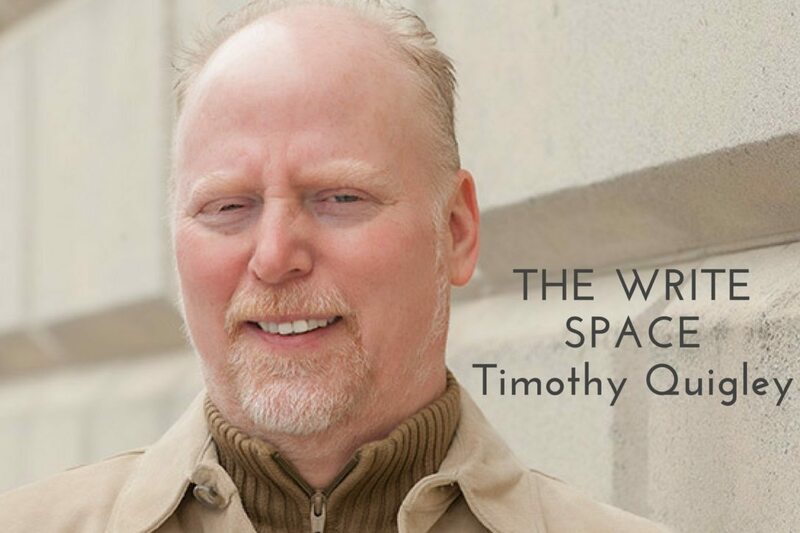 Timothy’s award-winning stories have appeared in the Chariton Review, Line Zero Journal of Art and Literature, La Ostra Magazine, Writer’s World as well as online publications. Besides writing fiction, he’s a script writer for Convergence Design and is currently working on two short films: one animated, and the other a live action adapted from his short fiction. Tim lives in Salem, Massachusetts and teaches writing at Salem State University and Wentworth Institute in Boston. Today is Part One of the four part interview. Stop by on successive Mondays for the next three segments! For more about Tim, visit his website, follow him on Twitter (@TimQuig) or check out his LinkedIn page! What type of writing do you do? If you do more than one kind or prefer one genre over another, what type is your favorite or most satisfying? I am primarily a fiction writer, though I do dabble in poetry from time to time. Lately, I have been writing scripts as well. I have done some smaller projects, a script for an animated film, and adapted one of my short stories into a short film script, and I have some contract work for a design company, some B2B to be advertising videos. Fiction is my forte, and this is primarily what I write. I definitely find it the most satisfying, although adapting my work for the stage or the screen is extremely gratifying as well. I get a whole different perspective on the work. I’ve published a little bit of poetry, but that is where I am most insecure, especially with so many of my colleagues who are so talented and accomplished. I feel more like an amateur compared to them in that realm. Do you find it difficult to switch from one writing type to another? What techniques do you use that help you switch “writing gears”? I don’t find it difficult motivating myself to switch, but adjusting modes can definitely be a challenge, especially when so much in script writing relies on the visual aspects of dialogue, where in fiction writing you have the luxury of a narrator to help paint the picture. Writing poetry for me is more on impulse, that is to say a line or rhythm or image presents itself to me, and I take it from there. I don’t ever really sit down and say I’m going to write a poem today. You also teach writing, both at Salem State University and Wentworth Institute in Boston. How has teaching writing helped you as a writer? Teaching writing has definitely helped me as a writer. I teach rhetorical writing, criticism, research, and creative writing as well. Immersing myself in reading and writing and everything related is quite inspirational and, as I tell my students all the time, when we become better editors, we become better writers. So editing the work of my students helps me with my own prose. When I’m teaching a creative writing course I am constantly in awe of the talent of my students, as well as the caliber of their insights to their peers’ work. They are constantly teaching me and coming up with articulate assessments of work discussed that I can completely miss myself. How long have you been writing? When did you start? Why did you start —what triggered your writing? I first aspired to write in my teenage years when I really developed a love for reading on my own, aside from school assignments. I devoured all of Stephen King’s early works and loved the horror, mystery, and suspense genres. However, I was introduced to the classics as part of my studies, and the masters of the short story really caught my attention: O’Henry, Jackson, Hemingway, Fitzgerald, etc. I was enthralled by these slices of life, captured like poignant Polaroid snap shots that, despite their brevity, immersed the reader in captivating tales with remarkably complex characters. What was your “writer dream”—your goal— when you began to write? What is your “writer dream” now? Well, when I was younger I dreamed of being a best-selling author who could rent a villa in the south of France and sit out on a deck along the ocean with my laptop and write the next classic, while receiving guests. I think I am doing my dream job, which is teaching writing and having the time to devote to developing my own projects. Sure I would love to be a best-selling author and support myself from my writing, but I would miss teaching terribly and think I will always do it. I think a part of me has always known it. I first felt like a legitimate writer when others in my life started to take me seriously as a writer. That was probably after I got into an advanced fiction workshop at Yale, and then graduate school for an MFA. What does the act of writing bring into your life? Why do you want to write? I have a strong compulsion to write. It nags at me constantly. Writing for me is like a bridge between myself and the rest of the universe. I have a need to share what I see, what I think, and what I feel. If I don’t do it, then I have this other sense of incompletion and frustration that follows me around as well, like this cosmic and perpetual to-do list. Who are three of your favorite authors and why? I have too many to name a favorite, but gravitate toward literary fiction. Aside from some of the classic writers I mentioned earlier, I am a big fan of Michael Cunningham, David Leavitt, and David Sedaris. They are all of my generation. The first two simply write exceptionally well; Cunningham is a magician with prose, and Leavitt is a master at lifting back that proverbial curtain on the average American lives. Sedaris is so very talented as well, but he makes me laugh out loud wherever I am reading his work. With a nod to James Lipton, host of “Inside the Actor’s Studio”: what profession other than that of a writer would you like to attempt? Hmmm. That’s a good question. I worked in the restaurant business for many years and have fantasized about opening my own place, a bookstore-café-of-sorts. A place where you could buy books and food and listen to readings of poetry and fiction, etc. That is a very reachable goal, however, I know from being in the industry for many years that it doesn’t afford much time for writing, especially if you’re an owner. You’re literally married to the business. We’re back with author Timothy Quigley, whose novella, Kissing the Hag, was released Fall 2015. An award-winning writer, Tim’s stories have appeared in the Chariton Review, Line Zero Journal of Art and Literature, La Ostra Magazine, Writer’s World as well as online publications. In addition to serving as a script writer for Convergence Design and teaching at Salem State University and Wentworth Institute in Boston, Tim is currently working on two short films: one animated, and the other a live action adapted from his short fiction. Part One of the interview is live here, and next Monday the blog will have part three! Typically, I do most of my writing at home, though sometimes I really have to get out of the house. It’s funny, but when I’m home I’m not only in my study where I have my desk and all my books. I am at the dining room or kitchen tables, or on the couch, or in an easy chair. It depends in which part of the process I am. When I get out of the house, I usually go to a coffee shop or sit somewhere by the ocean. Where is the strangest place you’ve written? Where was the most inspirational? In my study I have only inspirational items on my walls, and all my favorite books that surround me. There are so many in there that I will never read again, but they are like old friend. The strangest place I have ever written would probably be behind the bar when I was a bartender. I would literally scratch out ideas on cocktail napkins and sketch stories on the backs of blank checks. I still have some of them stuffed in old journals. When do you usually write: are you a morning writer, late night writer, any-time-you-can-grab-a-minute writer? I am most productive when I write in the first part of the day. There is an old Russian proverb that says The morning is wiser than the evening. I think this is true in many senses. I am more productive when my mind is less crowded by the silent noise of the day. However, this is not always possible, especially when I have an early morning classes, so I fit it in when I can. Is writing your full-time career? Part-time career? Part-time career. I teach four or five classes per-semester, and write around that schedule, though I wish it were the other way around. On average, how much time do you spend writing a day? Do you have a schedule that you keep? Well, my schedule changes every semester. I like the variety of that, but it’s hard to get a regular writing schedule down. I do more writing on days when I have fewer classes, but there always seems to be a pile of essays that need grading, or a lesson plan that needs prep, and I usually try to clear my plate first so that I don’t have these distractions. I try to keep on a schedule, but the workload sometimes dictates otherwise. What stimulates your creativity or serves as a writing inspiration? Conversely, what creates a major writer’s block for you? Do you ever get “stuck” when writing—have trouble beginning a project or getting through it? If so, how do you handle those “work-in-progress” ruts? I have so many ideas sketched for stories, and always have a few different projects going, so if I’m at a roadblock on one, I can usually pick up another. Do you have any writing totems? Superstitions? Strange routines? Things you do or have to have around you when you begin your writing process? I always do a first drafts by hand as this helps me to stay on the creative side of my brain. I can just write and write without stopping to check syntax or spelling or punctuation. Then, I put on my editor’s cap when I actually transcribe it into a word processing file. I can certainly type on my computer in free-write-gear, and not stop to check punctuation, etc. I feel that it’s a little superstitious that I refuse to give up this process. It’s the way I’ve always done it, and it works. Do you keep a journal? If so, how often do you write in it? Is it for personal reflection, for tracking writing ideas or both? How do you use it? I keep journals, but I do not write in them every day. Rather, I jot down ideas for new projects, as well as inspiration for those I am in the process of writing and/or editing. Therefore, my journals are really note books filled with patchwork, but they make sense to me. I love the creative process, and when a story is developing and it takes on a life of its own. This can be quite thrilling. I like proofreading the least, because I tend to miss my own most fundamental errors, and it’s all very tedious. I always need a second pair of eyes. Every writer does. What was your favorite childhood book? Is there one that, now as an adult, you read again? I had so many favorite books that is a difficult question to answer. I loved EB White’s work, especially Trumpet of the Swan, and was a big fan of Roald Dahl— my favorite of his would have to be James and the Giant Peach. Shel Silverstein was also a fave from my childhood, and I have given The Giving Tree as a present many times over. What type of books do you prefer: non-fiction, fiction, essays, poetry? Definitely fiction, though I do dabble in some non-fiction and poetry. Well, being an English teacher, I constantly have piles of papers to read and grade, as well as reading to do for class, so I save the end of the day for my own reading. Usually, most of my personal reading is done in bed before I go to sleep and that, for me, is a sacred part of the day. Oliver Pepper’s Pickle, by John Picardi. I highly recommend this one. What book—or author—do you find yourself reading again? I find myself picking up Pressfield’s The War of Art over and over. For such a slim volume it’s very dense and, I think, any artists, writers, painters, etc. would find it motivating and inspirational. Gibran’s The Prophet is also one that I have found myself coming back to over the years. Who has inspired you — either at a personal level or as a writer? I am most often inspired by the courage of ordinary people, and the many, many stories that I come across in everyday life—whether it is the trans-kid braving it all to walk across campus as the person he or she feels that they are, or that one person who can confront themselves while in the throes of drug or alcohol addiction and face their darkest-self and come clean by owning it— with the perseverance to start over from scratch. Those people blow me away on a regular basis. Which three authors would you love to have a “One on One” with? I first aspired to write in my teenage years when I really developed a love for reading on my own, aside from school assignments. I devoured all of Stephen King’s early works and lo ved the horror, mystery, and suspense genres. However, I was introduced to the classics as part of my studies, and the masters of the short story really caught my attention: O’Henry, Jackson, Hemingway, Fitzgerald, etc. I was enthralled by these slices of life, captured like poignant Polaroid snap shots that, despite their brevity, immersed the reader in captivating tales with remarkably complex characters. As a writer who has been praised for your short stories, what do you think makes a good one? A good story is one that takes the reader somewhere they have never been, even if that is only a glimpse beneath the surface of a place with which they are quite familiar. Perhaps this is a peek into the mind of a person who is contemplating something we have all thought or of which we are already aware, but the writer brings us to another level of awareness. Tell me about your latest, Kissing the Hag? I've read you are currently working on a film adaption? Hag actually came from two short stories that I was working on: one was about this kid who was living in the city and there was an old alcoholic woman who lived in the neighborhood whom everyone regarded as crazy because she was always talking about angels, and to them when she was drunk and on the streets. He was fascinated, and would talk to her, and about her angels, all the time… Then there was another story with this guy who was working the graveyard shift at a shelter. His life had come to a standstill via some existential crisis, I wasn’t sure what, and he got it moving again through his experience on one particular night. Both stories were at a crossroads and lacked something, so I made the old alcoholic woman a bag lady at the shelter. I still needed the crisis, and I ruminated over a divorce or death of a parent, but neither had ever happened to me. My brother had taken his life but I felt that using that would be exploiting something that was deeply personal and painful, until another more experienced and wiser writer told me to “Exploit with a vengeance! It’s what writers do. We use what know. Exploit away, my friend.” But I did not want it to be an autobiography, either, so I had the protagonist learn lessons that I already knew. I didn’t do anything that he does in the book such as leaving his job and cutting himself off from friends and family, but I did work the nightshift in a shelter when I was in undergrad in the 1980’s, and my brother did kill himself. But my life did not come to a standstill at that time. Instead, I was catapulted forward. And this also gave me distance from him as a character, and a wider perspective. Everyone has a story. Are your stories personally inspired or if not, what inspires each one written? Who is your favorite author and what is it that strikes you about their work? I have too many to name a favorite, but gravitate toward literary fiction. Aside from some of the classic writers I mentioned earlier, I am a big fan of Michael Cunningham, David Leavitt, and David Sedaris. They are all of my generation. The first two simply write exceptionally well; Cunningham is a magician with prose, and Leavitt is a master at lifting back that proverbial curtain on average American lives. Sedaris is so very talented as well, but he makes me laugh out loud wherever I am reading his work. What do you like to read when you aren't writing? Pretty much the same, though I am a news junkie. I used to subscribe to a few magazines and newspapers, but now I get everything online and on my smartphone. Write. Just write. And share your work with other writers instead of sticking it in a folder and wondering for months, or even years, if it is any good. It is important for writers to listen to every reader, but other writers are paramount for the caliber of feedback to take back to your desk for revisions. And remember that revising your work is not a punishment, but part of the process. The best ideas usually come from revision. 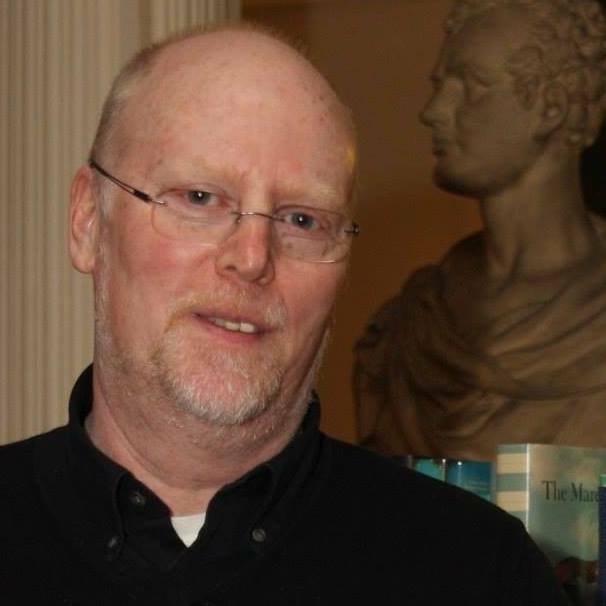 Timothy Quigley’s award-winning stories have appeared in the Chariton Review, Line Zero Journal of Art and Literature, La Ostra Magazine, Writer’s World as well as online publications. He is a script writer for CIDLabs LLC and is currently working on two short films: one animated, and the other a live action adapted from his short fiction. His novella, Kissing the Hag, was released by Pixel Hall Press in November 2015. The Write Space is a monthly Q&A series from Creative Salem covering a local writer and a Salem space s/he associates with writing. Questions? Contact susanna.baird@gmail.com. Timothy Quigley’s award-winning stories have appeared in the Chariton Review, Line Zero Journal of Art and Literature, La Ostra Magazine, and Writer’s World, as well as online publications. He has worked as a scriptwriter for Convergence Design and has developed educational content for online teaching platforms. His book, Kissing the Hag, was released by Pixel Hall Press in Fall 2015. He lives in Salem and teaches writing at Salem State University and Wentworth Institute in Boston. The problem with a particular writing space for me is that I get very restless in one spot, and must constantly switch it up. If I am home, ironically, I write most anywhere but at the desk in my study. I find that very confining after a short while. I then make the rounds to the dining room table, the sofa, the kitchen table, or an overstuffed easy chair. This also depends on the stage of the draft on which I am working. For hard-core editing and revision, I need to be seated at a table or desk, but for the more free-flowing early stages I only want to be comfortable and can work just about anywhere. But, sometimes I need to get out of the house, so a table at Jaho on Derby Street is great, as is Winter Island, but on the lighthouse side. There are always a lot of people around in the nice months, but it is usually pretty quiet and I can always find a place to sit by the harbor, or up on the grass under the shade of a tree. I have just finished a play adapted from my short fiction, and am working on a script adaptation of my book, Kissing the Hag, as well as a collection of short stories. … to be out and about with my pooch, Copper, around the Ocean Avenue area, or at Forest River Park. I also have a lot of history in the Wharf and Derby Street neighborhood, and frequently haunt that neighborhood and the cool places to hang out and eat such as the Witch’s Brew. I am also a big fan of the Willows and spend a great deal of time there during the warm months. Lastly, the Peabody Essex Museum is truly one of Salem’s gems, and I visit there several times per year, and even tie writing assignments for my Salem State students to certain exhibits. Salem is such an awesome city, and has something for everyone. About Timothy’s novel, Kissing the Hag. This story takes place in the span of one night, while Julien, the main character, is working the graveyard shift at a homeless shelter in downtown Boston. His life has come to a standstill since the suicide of his youngest brother, Mark. He’s quit his job, moved out of his apartment, isolated himself from family and friends. Throughout the course of the evening Julien takes readers on a dark, sometimes mystical, and sometimes terrifying course as he traverses the dim caverns and blind curves of the human spirit via flashbacks and interactions with shelter guests throughout the night. There is Celtic mythology woven into the theme, as well as subtle, but powerful imagery of the theater, and fire, both central to the book’s motif. Before daylight, Julien will begin to get his life moving again. Along with the timeless issues of alcoholism and mental illness, the story also deals with teen-suicide, which is presently of epidemic proportion in this country. The story finishes with an intensely positive message, while using mythology, Christian dogma, street smarts, poetry, New Age-drunk talk, and mad men’s ravings, along with simple human compassion as the springboards for a deeply spiritual experience, told through a spiritually hip but jaded and disillusioned protagonist.